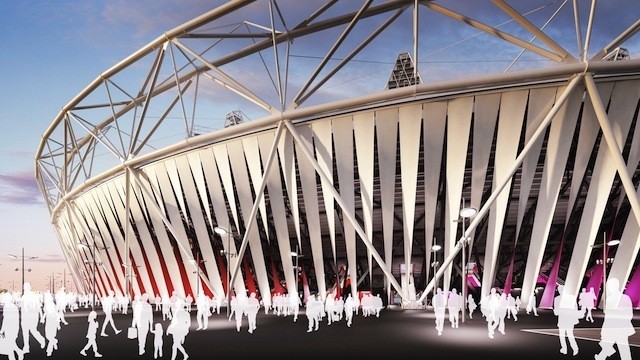 The Olympic Stadium won't be nekkid for the Games after all. The decorative wrap that was cut from the Olympic budget in November last year has been reinstated thanks to a fairy godmother corporate sponsor in the shape of Dow Chemical Company. It's more like a grass skirt than a curtain, comprising 336 individual panels – each approximately 25m high and 2.5m wide. Dow have pledged to make the wrap sustainable, using some 'post-industrial recycled content' to make it and 'repurposing' it after the Games. The new image above is devoid of the colourful athletic figures that were poised to decorate the original wrap. It also lacks any visible branding from the sponsor. We'll have to wait and see if it will stay this way. Installation will be completed by spring 2012.